WINNIPEG -- A Manitoba indigenous leader has dropped a lawsuit against a high school teacher over Facebook comments that called aboriginals lazy. 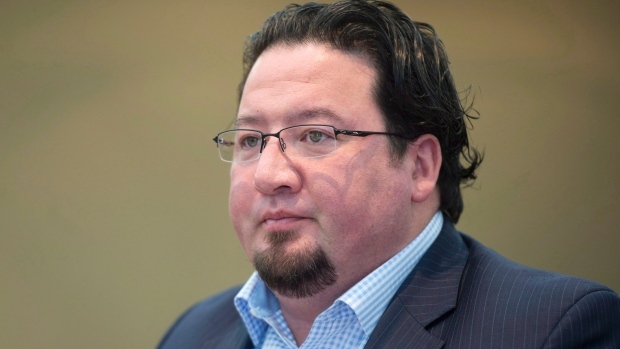 Grand Chief Derek Nepinak of the Assembly of Manitoba Chiefs said Tuesday he received an apology from Brad Badiuk during a mediation ceremony the two attended, helped by an elder. "We employed some traditional ceremonial methodology in terms of sitting down and resolving the issue," Nepinak said. "It was basically a circle where we sat down with our medicines, we did prayer and we had an exchange of ideas. Brad had the opportunity to share some of the issues that I think perhaps contributed to the way he conveyed himself on social media." Badiuk, a technology teacher at Kelvin High School in Winnipeg, was placed on leave more than a year ago, after comments were posted on his Facebook page that accused First Nations people of being lazy and seeking free money from non-aboriginals. Some of the comments were directed specifically at Nepinak and suggested he wanted to "get his hands"' on other people's money. The comments made national headlines and were denounced by people including Murray Sinclair, head of the Truth and Reconciliation Commission. Nepinak filed a statement of claim that alleged the comments defamed all indigenous persons. The Winnipeg School Division investigated the matter and has consistently refused to release any details on how it dealt with Badiuk. His name does not appear on the current staff list at Kelvin. "We are committed to providing a safe and inclusive working and learning environment for all of our students and our staff," division spokesperson Radean Carter wrote in an email Tuesday. "As such, we believe all (division) staff have the right to confidentiality. Therefore, we have no further information to share on this issue at this time." Attempts to reach Badiuk were unsuccessful. His Facebook page was taken down soon after the comments came to light. Nepinak said Badiuk agreed to learn more about aboriginal history. "I was satisfied that there was sincerity in how Mr. Badiuk approached the issue and we walked away from the courtroom without actually having to go there," he said. "I believe that, as part of reconciliation, we have to recognize oftentimes that going straight to the courtroom -- or into a litigation environment where we lawyer up -- is not always going to lead to resolutions that are going to satisfy all parties involved."